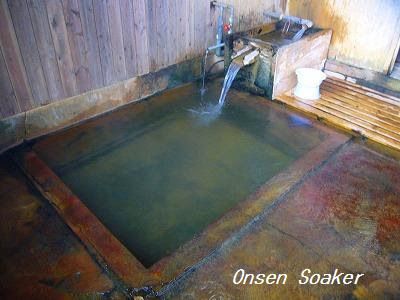 onsen soaker: Kita Onsen Ryokan, Tochigi Pref. 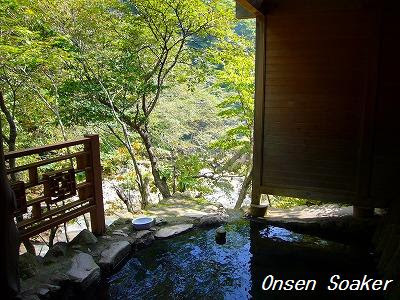 Kita Onsen of Tochigi Pref, Kanto Region might be too famous to say hitou or hidden onsen. But this is one of my favorites. 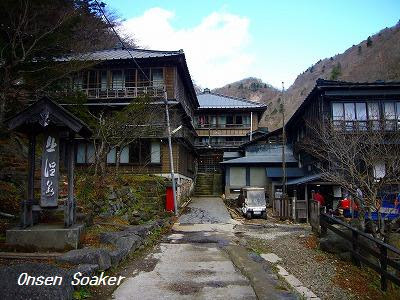 There is only one Japanese inn "Kita Onsen Ryokan" at Kita Onsen. What's the charm? Well, parts of the building including 20 guest rooms were built in later 19th century, and they are still in use today. I mean you can stay at a room built in Shogun & Samurai days of Edo Period. I still can't believe wireless Wi-Fi internet access is available now (But their website says so). The oldest and best known bath is "Tengu no Yu", a bath of Tengu. The Tengu is one of the legendary monster-spirits of Japan (more information on Tengu in Wikipedia). As you see their face masks in the picture above, they are believed to have red faces and Pinocchio-like noses. 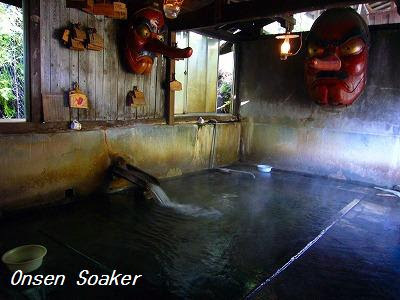 It is said a Tengu had found Kita Onsen in late 8th century, that's why the bath was named "Tengu no Yu". This is an indoor mixed bath without changing room. Actually, it's more like a part of corridor than a bath room. A private bath. You can lock the door from inside. An Open-air bath for ladies. Men's bath is bigger and you can expect better view. An indoor bath on third floor. Only for ladies. Another indoor bath for ladies. There is a same bath for men at next room. They accept day visit from 8:30 AM to 4:00 PM. Admission fee is JPY 700. Overnight stay costs JPY 7500 - 9500 with dinner and breakfast. Newer rooms are more expensive. You can go to the Kita Onsen by buses from the Kuroiso Station of Tohoku Line. Take a bus to Sanroku-ekimae(山麓駅前, Nasu Ropeway) , get off at Omaru Onsen (大丸温泉) after about 50 minutes ride, then change buses toward Kuroiso Station, get off at the second bus stop, Asahi-kitayu Iriguchi（旭北湯入口）. I mean buses between Kuroiso Station and Sanroku-eki go and return through different routes, and the nearest bus stop from the Kita Onsen is on the returning road. From Asahi-kitayu Iriguchi, it takes 20-30minute on foot to the Kita Onsen. Or you can walk all the way to the Kita Onsen from the Omaru Onsen bus stop, taking about an hour, I guess. There are 11 buses each way daily. Thank you for your comment and e-mail. 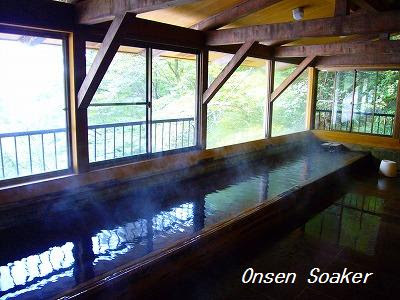 I am glad to find an onsen fan soon after starting this blog. I hope to keep updating this blog every 10days or so. Ganbarimasu. 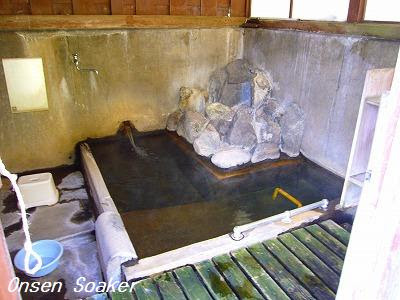 An onsen in Shinjuku, Tokyo is coming up next! If you know an old style onsen down town Tokyo subarashii. About 140 Km from Tokyo with the train Superview Odoriko,IZU peninsula there is a very nice place called Hokkawa direct along the sea. I've never been to there. Too open.ZETTAI MURI for me. I might visit there at ledies time. But it starts 7:00PM, too late to enjoy sea view. By the way , what are you wearing in the bath to be so afraid: the large towel around your bodu or the small traditionnal towel. This is one of the most mixed onsen i have been, and the people who comes is very open minded about their body. My japanese is limited but allways people is interested to speak with me. I allways feelt like a big family and not i come to see you and you come to watch me. Wow! Nice to see this place again!! 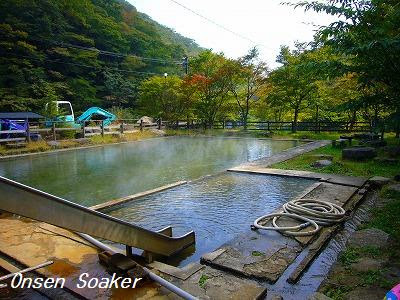 I've actually visited this Onsen with my husband and two daughters, 6 and 8 at the time, back in 2004. To be honest, my kids were kind of hesitant at first, but after a few hours of being there, they were running around the Ryokan and baths with the other kids, just as naked as they were, without a worry in their minds! In addition, the other guests had no problems with the kids roaming around freely, and nothing negative was said or done. This was a great experience for us, and a great place for us to shed off our nationality for a while, experience the real Japanese culture, and let our kids be kids without having to worry about what everyone else thought! We truly miss that place! We're a couple that will get married next November. We'd like to go at Kita Onsen, but unfortunately we don't speak japanese. Somebody could tell us if the staff speak english?